The Taurus wall mounting for punching bags is suitable for punching bags up to 60 kg. 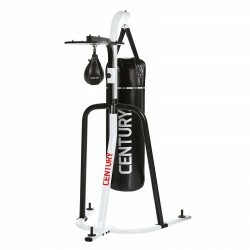 The Century punching bag stand Heavy is made of 75 mm strong steel - a very sturdy punching bag stand, which can take punching bags of up to 45 kg. 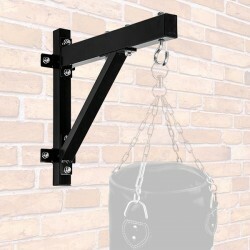 This punching bag mount is perfectly suitable for punching bags, which are not meant to be mounted on the wall. Thanks to the big set-up space, a great stability is always ensured. The Everlast punching bag wall fixture is also suitable for heavy punching bags. The Taurus chin-up bar/punching bag fixation is easy to mount, extremely loadable, and an ideal fitness equipment for back training and exercises on the punching bag. 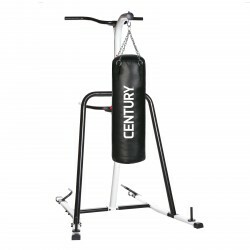 The Century Heavy Bag punching bag stand with Speed Bag Platform is a combination of a portable punching bag stand and a classic Speed Bag Platform. The advantage of this combination is that only a small space is required for setting it up and you do not have to mount it on the wall. The Speed Bag Platform is ideal for speed strength training as well as for an increase in the own responsiveness. The Heavy Bag punching bag stand is made of a very sturdy steel frame and offers the possibility to add weight. The Taurus ceiling fixation for punching bags allows a safe suspension of a punching bag. 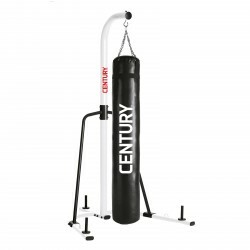 The Century Fitness Training Station combines a classic punching bag stand with a training module. 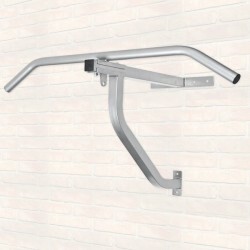 Besides the chin-up bar mounted on top, the training module also offers you the option to do dips or alternatively push-ups on the lower handles. The punching bag mounting is perfectly suitable for the use of big punching bags of up to 45 kg. A great all-in-one machine which requires only small space. The Everlast punching bag mount serves as safe fixation of punching bags of each kind. While exercising on a punching bag, it can come to a point. In order to provide a safe and comfortable training, we recommend a professional punching bag mounting for purchasing a hanging punching bag. We offer you punching bag mountings in different versions and loadabilities. Ceiling mountings are best, when the punching bag should be reached from every side like a real opponent. 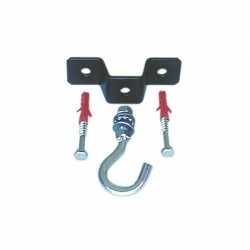 Regarding mounting on walls, we offer you punching bag wall mountings, regarding placing the punching bag without drilling, we recommend you one of our punching bag stand mountings. Furthermore, we offer you combined punching bag mountings, which have either a punching bag suspension as well as further training equipment, i.e. a speedball device.